JINING, Shandong - "Hail to the bus driver, bus driver man," the chorus might go. Even if his student passengers are better behaved than Bart Simpson, it's a chorus they could sing with gratitude as Hu Lingjun ferries them safely back and forth to school - in his spare time and with money out of his own pocket. "I just want to help the children get to school safely," Hu said. "Each time I see the children riding bikes on such a bad road, I have a strong desire to drive them to school." The 41-year-old Hu, who leads a 10-member team driving a regular bus line past the school, has opened a special route to help the students get safely to Guolou Middle School along a dangerous stretch of road - and charging them only a fraction of the cost. 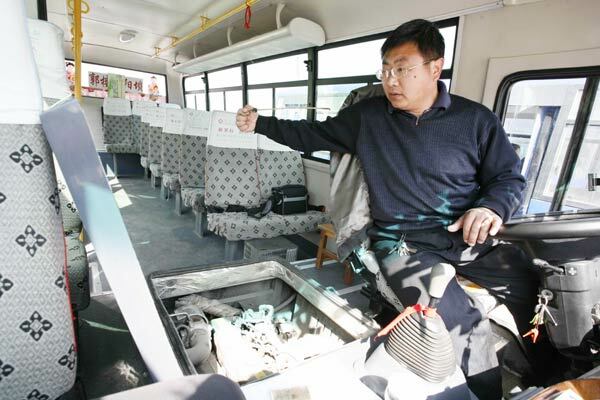 The stretch of road that sparked Hu's worries and prompted him to start up the extra bus extends for two kilometers near a coal factory in Wenshang county, Shandong province. On sunny days, trucks loaded with coal kick dust up into the air, covering the children's faces and blocking their eyes. On rainy days, students have to walk through puddles up to 60 centimeters deep. "I know how hard it is for the children to walk on this stretch of road," said Hu, explaining why he started the route. "Every time I passed by the middle school I saw lots of students taking vans home, with more than 10 students crammed into vans which should only carry seven people. It's not safe." The special line, which runs on each Monday, Wednesday and Friday when nearly 200 students need to travel between home and school, covers more than seven kilometers and passes through about 20 villages. The drivers take turns to run the special line when they are off duty. Each student is charged only one yuan (15 cents) - much less than the standard charge of six yuan. Sometimes Hu's team has run-ins with the van drivers who overload students into their vehicles. "I told my teammates never to get into a physical conflict with them. Once they start a fight, call the police," Hu said. Safety, above all, is the top of Hu's concerns, and he has asked all his team members, mostly in their 20s, to double check their buses before they set out each day. At first, Hu's wife was reluctant to give her support, though Hu persisted. With two sons in college, the family has to save more than 35,000 yuan to cover tuition and expenses each year, which Hu can barely make from running his regular route. "But I'm the head of the family, I have the final say," Hu said with a big laugh. "Many people said we would soon give up as we run a long route and charge a low price," Hu said. "It's true we can't balance our income and expenditure from running the school line, let alone make money." Based on the rising cost of diesel, they would have to charge the students 4 yuan each to break even. "To be honest, it's really hard. But we've resolved to hold on for the students, " Hu said. The team has come to a consensus among each other that they would share the cost of the bus line with their own earnings. Maybe that chorus should be, "hail to the bus drivers, bus driver men."